This post is mainly for my awesome penpal Aimee *waves* because she sent me a gorgeous pair of socks for Christmas (thank you again honey) . Anyway – my camera was being weird. 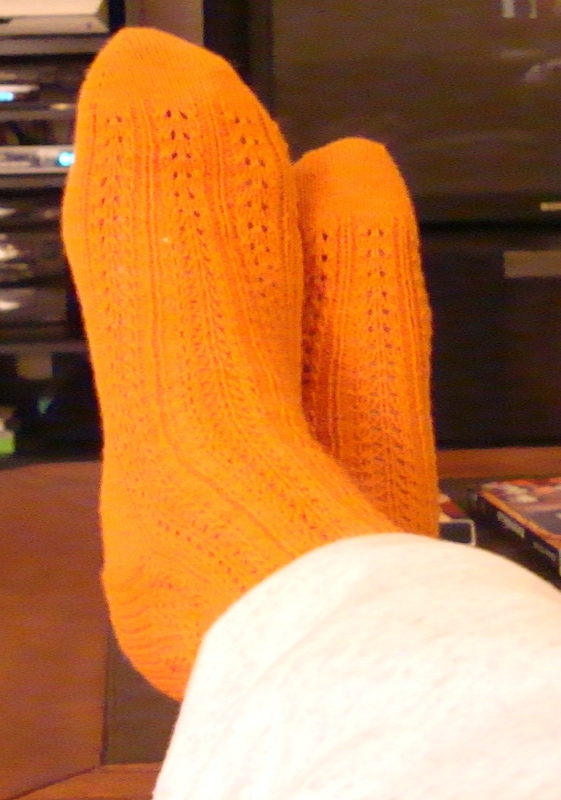 The socks are a gorgeous color orange – a warm orange. My mom didn’t believe that they were handmade. They are. One of my hopes for 2011 is that I learn how to crochet/knit more intricate stitches and designs and to make more useful things. Right now I have a request for a beanie from the son-in-law. Egads. The pressure is on. So here I am with my warm feet, and my new Christmas stuff that I will post about once I get pictures and such. Right now – I have to finish putting my house back to normal and find all my stationery and stamps so I can get caught up on my letter writing. Omg I’m so glad they fit, I’m always totally freaked that I’ll make them too big or worse, too small. Yay!